Being the parent of a teenager isn’t for the faint of heart. Seemingly overnight, the sweet toddler who was once begging you for another bedtime story is suddenly asking for the key to the family car so they can stay out past your bedtime. Gulp! Although it may be tempting to keep your teenager at home so you can keep them safe (perhaps using Dorothy Parker’s suggestion of letting the air of the tires), teens do grow up and eventually spread their wings. Inevitably, that means driver’s licenses, cars and parents spending late nights worrying over their teens and whether they are safe. Imagining your teenager driving is scary enough. Thinking your teenage driver will be involved in a car accident is absolutely terrifying. But if parents spend a bit of time thinking like a teenager (scary indeed! ), they will better understand the dangers their teen drivers will face behind the wheel. Then, when it comes time to discuss driving safety, parents will be in a much better position to educate and protect their teen drivers. First and foremost, parents must know that car accidents are the leading cause of death for teenagers. Parents can make a difference in their teen driver’s safety by educating themselves, then making the time to educate and motivate their teenage drivers to be safety conscious. 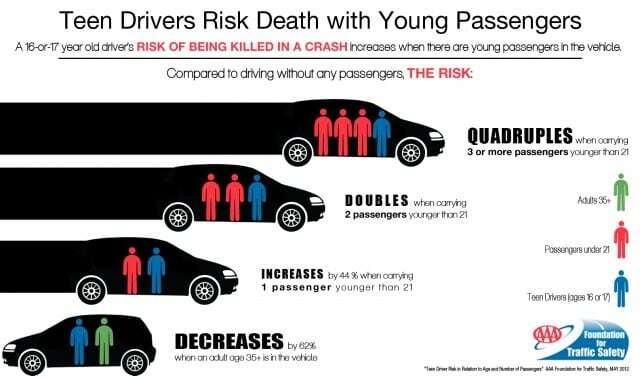 Begin by sharing the following facts and statistics with your teenager as an easy way to open a discussion about driver safety. Educating your teen about car accidents and vehicle safety will go a long way towards keeping them safe, and give you as a parent some much-needed peace of mind. Approximately two-thirds of teenagers who died in car accidents were not wearing their seatbelts. Approximately 2 out of 3 teenaged drivers killed in automobile accidents are males. 55% of fatal automobile accidents involving teenagers occurred on Saturday or Sunday. 22% of fatal automobile accidents involving teenagers occurred between 9 p.m. and midnight. Your teenager is 10 times more likely to be involved in a car accident during the first 500 miles they drive than an adult driver. Being a teenage driver is clearly dangerous. So how can parents help protect their teens from car accidents? Begin by educating yourself on the risks associated with teenage drivers, and then work on educating and motivating your teen driver to stay safe behind the wheel. One of the leading causes of teen car accident situations is inexperience. Parents can help protect their teenage drivers from car accidents by gradually increasing the time their teen drivers spend behind the wheel. Give them plenty of driving time, not just during the day, but at night, and in various weather conditions. Just because your teenage driver has their license doesn’t mean they are ready to face the variety of unexpected or hazardous conditions that can occur while driving. Make sure your teenager has as much experience as possible driving in different weather conditions. Allow them to practice driving in rain, snow, fog and icy conditions with you in the vehicle so that they can ask lots of questions, and learn how a vehicle operates under different road conditions. Make sure they have adequate experience driving on busy highways, and that they know how to change lanes. Discuss what they should do if they are involved in an accident. Talking to your teen about driving skills is vital, and allowing them time to gradually gain experience and confidence with different road, weather and traffic conditions is an essential part of keeping your teen driver safe. According to MADD statistics, 1 in 3 drivers will be involved in a drunk driving accident in their lifetime. Make it a priority to discuss the effects of alcohol and drinking and driving with teenagers. Don’t assume that your teenager understands that drinking and driving is unsafe simply because their driving training program or school has educated them on the matter. Drive the point home with clear examples of how alcohol impairs driving, and talk about the dangers of drinking and driving often. Although it may not seem like it, what you say does matter. Your teen is listening to you, even if they roll their eyes and act as if they know everything! According to MADD, more than half of children killed in automobile accidents were riding with a drunk driver, and alcohol is responsible for approximately 25% of fatal automobile accidents involving teen drivers. However, most parents aren’t aware of the dangers of underage drinking. Studies show that 1 in 6 teens binge drinks and almost 1 out of 3 eighth graders have tried alcohol. Yet only 1 out of every 100 parents surveyed believe their child binge drinks. Clearly, there is a discrepancy between how parents think their teens are behaving and the reality of underage drinking and driving. It is absolutely vital to educate your teenage driver about the dangers of drinking and driving. Make sure they know what to do if someone they are riding with has been drinking and that they understand they can call you if they have been drinking so that they don’t ever make the mistake of getting behind the wheel after consuming alcohol. Their safety should take precedence over any fears of being “in trouble” for calling you should they need a sober ride home, and they need to know you’ll be there for them if they’ve made a mistake. Another important way to keep your teen driver safe is to educate them on the dangers of distracted driving. Cell phones, radios, and electronic devices are notoriously dangerous distractions for teens. According to researchers, at least 33% of teens admit to texting while driving, and over half of teens admit to talking on their cell phones while driving. 40% of teens say they have been a passenger in an automobile when a driver has been using a cell phone in a way that puts themselves or others in danger. Becoming a driver for the first time is certainly a right of passage for teenagers. But it’s also a right of passage for their parents. Most parents know it’s important to teach kids to brush their teeth, say please and thank you and turn in their homework in on time. But educating teenagers about the dangers of distracted and drunk driving and preparing them to be safe, responsible motorists is another matter entirely, and it’s not something most parents are ready to discuss when the time arrives. But you can be a role model by educating yourself on the dangers teens face on the road. But most importantly, be a good role model for your teen. Don’t be a distracted driver. Your teen certainly isn’t going to listen to you preach about the dangers of distracted driving if you text behind the wheel. Don’t drink and drive. When you are in the car with your teen, use the time you spend together to discuss driving conditions, common road hazards and situations that might arise and how your teen could deal with them. Make sure they know you care about their safety and are there to support them as they learn. Teenagers believe they’re invincible. (Of course, they do. You were as well!). Arnold H. Glasgow put it well when he said, “Telling a teenager the facts of life is like giving a fish a bath.” But as a parent, you can give your teenager the facts about driving safety if you arm yourself first. Be prepared to discuss every aspect of driving safety with your teenager before they become full-fledged drivers, no matter how difficult or awkward the subject matter might feel. The personal injury attorneys at Hardy, Wolf and Downing want you and your family to be safe. If you or a loved one has been involved in an automobile accident in Maine, we can help you assess your case and receive the compensation you deserve. With three locations to serve our clients, our offices are conveniently located in downtown Portland, Lewiston and in Portland on Auburn Street. Our experienced personal injury lawyers work hard for our clients and know how to deal effectively with insurance companies so that you get the compensation you are entitled to.